The calculation of the EU dimension in cases stemming from the Merger Regulation – i.e., the test whether a concentration to be examined produces effects at the Community level – is an issue that, thanks to Morten Broberg’s extraordinary work, has transcended the legal uncertainty it might have engendered. This classic has held the field through three editions since 1998. Now, with this new Fourth Edition, Dr Broberg not only brings all his penetrating analysis to bear on the newest official developments, but takes into account recent case law and the ongoing legal literature in the field. new perspectives on ‘undertakings concerned’, ‘groups’, and the notion of control. As before, the author provides detailed elucidation and guidance on the Merger Regulation rules, such as those pertaining to financial year, taxes and intra-group sales, geographic allocation of turnover, financial institution and insurance undertakings, the EEA competition-enforcing system, and forum shopping. The book concludes with a discussion of the ‘real Union dimension’ and the author’s recommendations for improving the delimitation of the Merger Regulation’s jurisdiction. An annex reprints the 2004 Merger Regulation and its implementing Commission regulations, as well as key Commission notices. 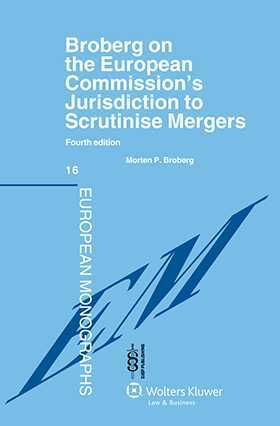 With the Fourth Edition, The European Commission’s Jurisdiction to Scrutinise Mergers remains the definitive guide to the subject for businesses and their legal advisors, as well for competition law enforcers at the EU and Member State levels. Chapter 2. The Undertakings Concerned. Chapter 3 . The Group. Chapter 4. The Basic Rules. Chapter 5. Geographic Allocation of Turnover. Chapter 6. The Financial Sector. Chapter 7. The EEA Agreement. Chapter 8 . Forum Shopping under the Merger Regulation. Chapter 9. The Real Union Dimension.